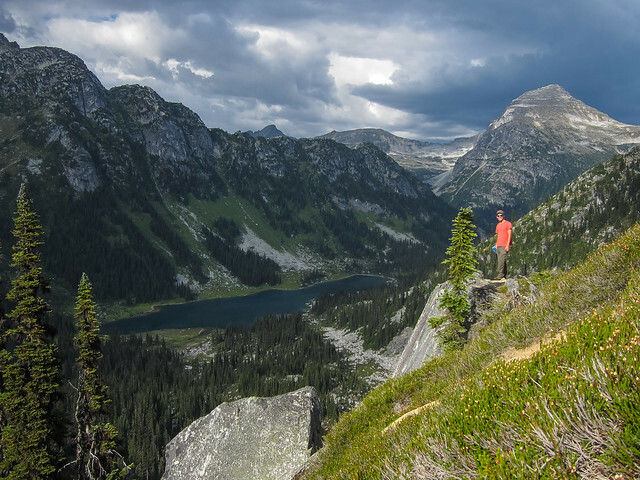 “A long-weekend two-night trip to Marriott Meadows and Rohr Lake. Four of us made the trip and were fortunate to have a driver with 4WD 🙂 It’s a short access road to the trail head if you have to walk though. Lots of bugs the whole time: mosquitos, black flies, deer flies, you name it, they were biting us. I would suggest bringing bug hats at the least (or waiting until later in the season). One of our crew had a small over-bed mosquito net that pretty much saved us as we could eat under it, etc. That being said, my skin was mostly covered, I used almost an entire small bottle of Ben’s 30% deet spray, and I still managed to get almost 100 bites! The others seemed to have fared a bit better. First night was spent at Rohr Lake. The trail to Rohr Lake is muddy in several spots. The last steep hill up to the lake is definitely muddy and slippery and requires care! Alternatively, you can head up the boulder field next to the path with ease. There seem to be about 6 spots for camping at the lake. No toilet or cache, and the trees aren’t ideal for hanging food. Lake is cold but swimmable! The hike to Mt. Rohr takes about 2 more hours from the lake. It’s mostly boulder fields, but well cairned for the way. Second night was spent at the lake just below the Wendy Thompson Hut (we heard the hut was overfull with a large group of 22, plus others). Again the hike was muddy with a few creek crossings on logs. The terrain was varied with forest paths, meadows, and boulder fields. No apparent obvious camp spots on the lake, just put up our tents on a dry patch of grass. Lots of hikes from here to explore. The lake was cold but refreshing and great for swimming! “Sometimes the weatherman does get it right. A few people (understandably) only wanting to see the ridges around The Brian Waddington hut in decent weather decided to postpone due to poor reports. However at the last minute the reports changed to say only rain in the morning and late after noon of Thursday, and in late morning Friday. Both were bang on. We had a leisurely hike in to the cabin in mild temperatures and slight overcast, and then we did a side trip up a slope near Gandalf mountain and got caught in a thunderstorm 5 minutes from the cabin where we ate dinner warm and inside. In the morning a dry hike out until the last 10 min before the truck. The Brian Waddington hut sits at the end of Long Lake surrounded by peaks named after notable Lord of the Rings characters. Wildflowers were out and the whole place is very picturesque. Moreover, with the possible exception of Elfin Shelter, this is one of the nicest huts I’ve ever been in, and we had it all to ourselves. The VOC takes very good care of it, at $10 it was a bargain to stay warm and dry. Like any Pemberton hike, this one was worth doing as an overnighter or more if you want to explore those ridges.